Hi! Looking for more information? We take great pride in the quality of our products. Please share your contact information with us so we can handle your request appropriately. You can always call a representative between 8 a.m. and 5 p.m. Central, Monday–Friday. 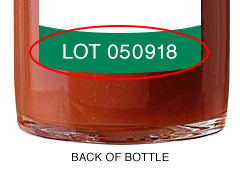 See how we make and bottle TABASCO® sauce on our island home in south Louisiana. Tour our factory, visit our museum, explore Jungle Gardens, or try some Cajun food in Restaurant 1868. It’s all here on Avery Island!